Up to 349 | What Car? 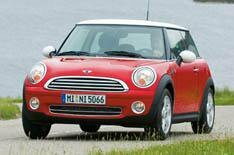 With its go-kart-like handling and well weighted steering, the Mini is an absolute hoot to drive. The Cooper looks great, too, and the strong resale values help to keep running costs down just as well, given the high list price. There aren't many cars as distinctive as the C3 Picasso and there aren't many cars this small that are this practical, either. Yes, it's dearer than a similarly sized supermini, but it's worth the extra it costs. Great to drive and sharply styled, the Mazda 3 is an excellent alternative to the more mainstream Golf and Focus. It's comfortable and pretty spacious, too, and the icing on the cake is 62.8mpg average fuel economy. You'll struggle to get much more car for your money than this fine estate, which has plenty of room for passengers and their luggage. The ride and handling are good, too, and the engine belies its size with surprisingly brisk performance. Too many seven-seat MPVs don't really cater for seven, but the Grand Scenic is one that does. There's reasonable room in all three rows of seats, and dynamics that balance decent handling with a generally smooth ride.